XLR 3-Pin connector cables ends are an industry standard for microphone and audio signal cables. Out of the three pin connections, one is for positive signal, one for negative signal and the third is for 'balanced' ground connection to the cable sheilding. There is also a locking mechanism in most XLR connector designs that keeps the connections fixed together even when being pulled on or jostled. 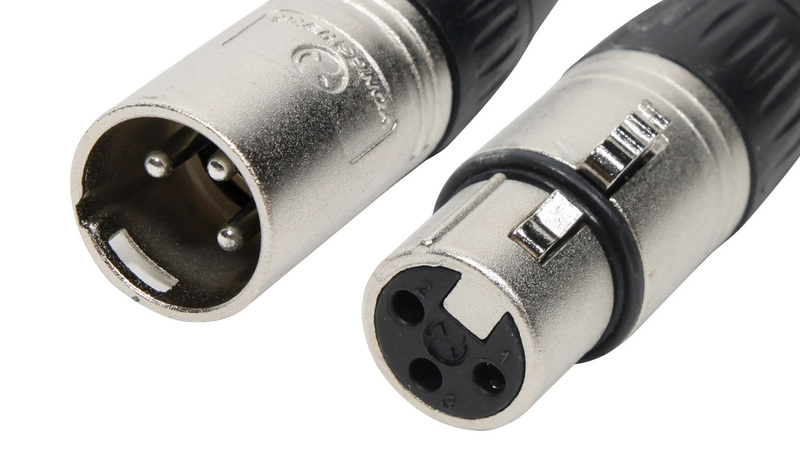 An XLR connection is a cable-end housing that has male and female counterparts with varying numbers of pin connections depending on the cable use. A 4-pin configuration is most often used in the film and media industries to carry low voltage power supplies in the 12-24 volt DC range. As an example, Arri cameras use 4-pin for their power supplies.